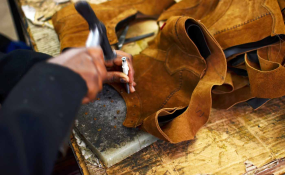 Addis Ababa — Africa needs to abandon dependency on imported leather products to develop quality leather products by using its abundant resources in the leather sector, Africa Leather and Leather Products Institute (ALLPI) Executive Director Mwinyihija said. In an exclusive interview with ENA, ALLPI Executive Director Professor Mwinyikione Mwinyihija said Africa has to transfer from depending on imported leather products to the development of local leather commodities in the product development value chain in countries using the leather sector's potential in the continent. He noted that all countries must work to bring the necessary skill to move from importing foreign leather products to manufacturing quality and value added leather commodities through sharing resources and finding a good source of income in the leather sector. "Africa is not poor as people think," the executive director stated, adding that "we just don't utilize our resources by amalgamating them and bringing synergy to the critical issue of development and the right practical issue that can stimulate and bring in income and alleviate poverty." According to him, youth participation is very low in leather value chain while the elderly are most active in the leather business. "In the studies we finalized, most of our youth are not involved in the leather value chain; and we found that the older generation is still in the leather sector. This is not good for the sector," he pointed out. Mwinyihija revealed that 25 to 26 percent of the global animal resources are in Africa, and this makes Africa the home for hides and skins resources. "However, we are contributing only about 1 percent of the leather products to the global market," he stated. The Executive Director said the continent is in deficit of leather products. "We are in a deficit. We need 1.4 billion pairs of shoes that we need in the coming 2 years because the population is coming to 1.4 billion. Deficits are running into 8,000 million pairs per year." He further pointed out that "most of the contractual prices that we are getting in Africa to the outside market are 10 to 30 USD per pair so you can imagine that the wealth is actual in Africa." Mwinyihija also emphasized on the need to develop policy and strategies by governments for the leather sector, and all 10 of the governments that ALLPI is associated with have agreed to develop policy framework through national leather value chain strategies. Furthermore, the Executive Director said countries must unite and complement one another and expand integration to resolve the issue of youth and the issue of poverty. "We are underestimating a potential that we never ever looked into, and this is the African market. This is really where we can build our SMEs and where the issue of free trade area is important," he added. Mwinyihija explained that in African "we are so demarcated and separated to an extent that we cannot sell our products in our own country. As a result, second hand material, poor quality material flies from all over the world to African countries."